The Viking Yacht Company has celebrated four and a half decades in business building luxury performance sportfishing and cruising yachts. Started by brothers Bob and Bill Healey in 1964 when they bought Peterson-Viking Builders, a small, struggling New Jersey builder of 37-foot, wooden sportfishing boats, Viking Yachts has grown to become a world leader in semi-custom fiberglass yacht production with over 4,000 Vikings delivered. With Bob at the company helm as Chief Executive Officer and deal maker, and Bill as company President, chief boatbuilder and head of the company's in-house design and engineering teams, this family-owned and managed business is still the industry leader. Viking Yacht Company can build over 100 high-end yachts, from 42 to 82 feet and valued at $1 million to $5.5 million each year. Skilled employees build yachts in Viking's state-of-the-art, 810,000 square-feet, waterfront-manufacturing facility year round. Not too long ago, though, the picture at Viking was anything but rosy. When the double-whammy of a nationwide recession hit in 1990, followed by the introduction of a federal luxury tax in 1991, the company went from 1,500 employees in two plants to just 80 employees in one plant. In general, the marine industry went into a tailspin that resulted in massive plant shutdowns and a significant rippling effect of related closures as ancillary businesses, such engine manufacturers, equipment producers and other vendors saw their markets dry up. The Healeys borrowed working capital and invested their own money to keep the company afloat. Bob Healey also was instrumental in organizing a national, grass-roots campaign to fight the tax based on a loss of jobs issue. In taking the industry lead, Bob organized busloads of out-of-work boat builders that converged on Capitol Hill. Other demonstrations took place on a regular basis around the country to plead for support in repealing the tax. In Rhode Island, a boat was set on fire aboard a barge in Narragansett Bay as a symbol of protest. It took better than two years, but by 1993 the luxury tax was history and Viking was poised to flex its muscles as boat buyers returned to the market. It is interesting to note that Viking's decision to remain open, despite dismal sales attributable to the luxury tax allowed the company to tool up for new models. Thus, when the tax was lifted, Viking roared to the front line leapfrogging over its competition firmly establishing Viking as the dominant builder in its class. The brothers' commitment to the marine industry is unique. Viking's open-door policy has welcomed students, vendors, competitors, legislators and others interested in boat-building technology to the New Gretna facility to see first hand what Viking has developed. Under Bill's leadership in design and engineering, Viking contributed to the development of, and was one of the first to adopt the American Boat & Yacht Council's (ABYC) Standards and Recommended Practices, as well as the National Marine Manufacturers Association (NMMA) Recommendations. Every model in the Viking line up is NMMA certified using ABYC standards. As a testament to their continuing attention to building a safe boat, Viking Yachts received CIGNA Recreational Marine's prestigious Award for Excellence "For their contribution to boating through training, education and the production of products which have helped set standards for safety and quality within the industry." An interesting aspect that sets Viking apart from its competitors is that the company manufactures about 90 percent of the items that go aboard each yacht. Except for major components such as engines, propellers, air conditioning units and appliances virtually everything is made on site. Viking molds its own fuel, water and waste tanks out of fiberglass, for example, so that the tanks fit into the lowest reaches of the bilge to enhance stability and maximize capacity. In addition, the tanks are then fiberglassed into place adding to the strength of the hull. Engine beds are fabricated from structural steel to ensure drive train alignment and handle the high horsepower output of modern marine diesels that allow mid-30 knot cruising speeds. A sophisticated metal shop welds aluminum into bow and safety railing. Computer controlled machinery in the mill cuts wooden parts with surgical accuracy and the hand-finished varnished teak interiors are a beauty to behold. Yacht interiors are professional designed and furnished on site. Bill and Bob, who have been very successful in building tournament sportfishing boats, feel a strong sense of obligation to the sea. They are founders of the Recreational Fishing Alliance (RFA), a non-profit organization formed in 1996 to promote sustainable fisheries and a healthy marine environment. Viking has contributed over $7 million to the RFA and the membership is now at the 75,000 mark. Spurred on by Viking's commitment, other environmental groups and people within the boating industry also have rallied around this important cause. Today, Viking enjoys an enviable status as the country's leading builder of convertible yachts, with many industry observers on record describing Vikings as the best yachts of their kind in the world. The Healey's entrepreneurial spirit was recognized twice by the national accounting firm Ernst & Young, which selected the brothers as its New Jersey Entrepreneur of the Year and then as runner-ups in the national competition. At the 2001 Miami International Boat Show, the Healeys were bestowed the prestigious Chapman Award by the National Marine Manufacturers Association and Motor Boating magazine for their contributions to boating for the benefit of the industry and the public. 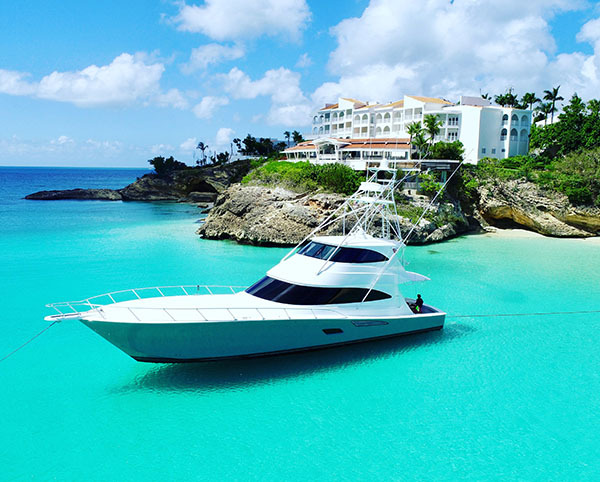 Viking Sport Cruisers, a company formed by the Healeys in 1996, has also been phenomenally successful, distributing British-built, high-end cruising yachts from 42 to 95 feet, built to Viking's specifications, through its dealer network in North America. In dealing with an owner base that is constantly seeking new and larger models, Viking produced the Custom 105, built in Viareggio, Italy, to Viking's specifications by Versilcraft. The new yacht made its premiere at the 42nd Annual Ft. Lauderdale International Boat Show in October 2001 and was awarded the National Marine Manufacturers Association Innovation Award at the Miami International Boat Show in February 2002. In February 2002, Viking opened a new service facility in Riviera Beach, Florida, near Palm Beach, to accommodate Viking owners who bring their boats south for the winter. The new facility features slips for in-water work, as well as land storage to handle larger projects and outfitting. A 125-foot by 150-foot shed with 50 feet of clearance will accommodate boats with tuna towers for indoor work. In December 2002, the Bass River Marina, adjacent to the Viking Yacht plant was bought back by the Healeys and reflagged the Viking Yachting Center. It was at this marina where the Healey brothers started their maritime careers. The brothers sold the property in 1964 when they devoted all of their energies to boat manufacturing. In early 2003, Viking formed two new companies, Atlantic Marine Electronics (AME) and Palm Beach Towers (PBT). Atlantic Marine Electronics is based at the Viking Yachting Center (with a satellite office in Riviera Beach) and is responsible for the sophisticated electronic navigation packages, which are installed aboard Viking Yachts and Viking Sport Cruisers. Based at the Riviera Beach, Florida, facility (with additional service bays at the Yachting Center), Palm Beach Towers designs and builds tuna towers and fabricates other aluminum and fiberglass components for Vikings and other yacht brands. At a very special breakfast presentation on October 29, 2003 during the International Boatbuilders' Exhibition & Conference in Miami Beach, Florida, Viking Yachts' Bill and Bob Healey were recognized by their peers and inducted into the National Marine Manufacturers Association (NMMA) Hall of Fame for their selfless contributions to the recreational marine industry. To this end, Viking established a charter school, the Riviera Beach Maritime Academy in Riviera Beach, Florida, near the Viking service facility. The goal of the school is to provide willing students with an academic background leading to a high-school diploma and hands-on experience in marine trades. Students work in both a classroom setting and a full-service boatyard. Upon graduation, students may attend college, or choose to enter a marine field of choice. The marine industry in South Florida has been estimated by the Sunshine State to be worth $13 billion, which easily surpasses the tourism industry. This means jobs in marine trades will always be in high demand and Viking has taken the lead to ensure these jobs will be filled by qualified tradesmen. At a time when the brothers could take a well-earned rest, Bob and Bill are busier than ever. When not promoting the Recreational Fishing Alliance or industry issues in Washington, D.C., Bob can often be found at Viking. Bill is at the plant daily overseeing new expansion plans and to ensure Viking is "building a better boat everyday." And of course, Bill still makes it a point to say goodnight to his employees each evening, a habit he started way back on April 1, 1964.